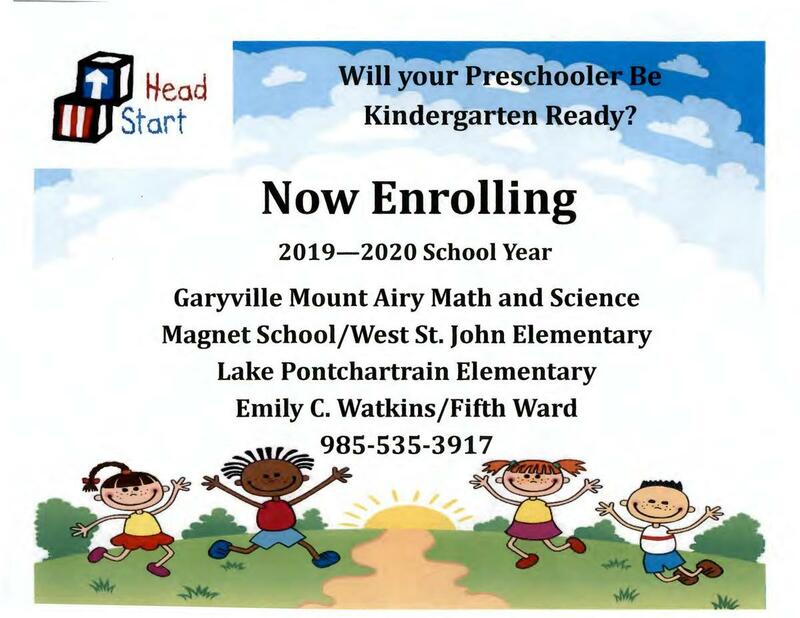 Applications are being accepted for the 2019–20 Head Start and pre-school programs in St. John the Baptist Parish. Many families have had a wonderful start to their education in these programs. 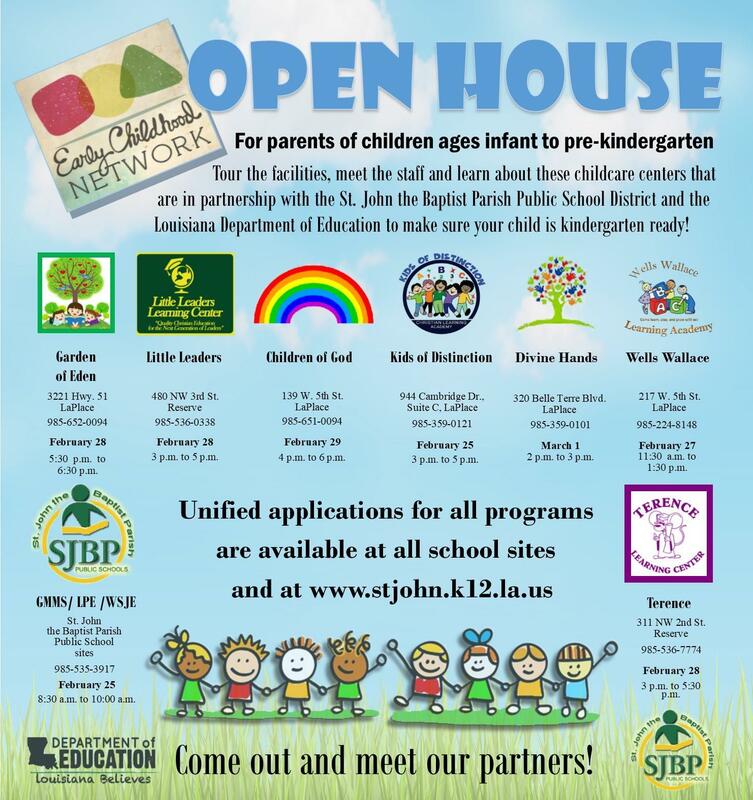 St. John the Baptist Parish has slots available for pre-school children that are not determined by income eligibility and are open to all. 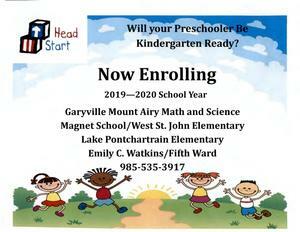 These programs are offered at Emily C. Watkins Elementary School, Fifth Ward Elementary School, West St. John Elementary School, Garyville-Mt. Airy Math and Science Magnet School and Lake Pontchartain Elementary School. Applications may be picked up at any of those sites and are also available here. To be eligible for these programs, children must be 4 years old by Sept. 30, 2019. Children must be 3 or 4 years old by Sept. 30 to apply for Head Start. 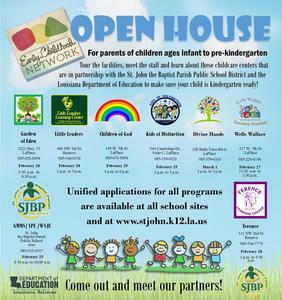 The 3-year-old program is only offered in the West St. John Elementary School zone. Applications can be picked up at all school sites or the School Board office at 118 W. 10th St. in Reserve. Completed applications, with all required documentation, should be returned as soon as possible to the Head Start program at Garyville-Mt. Airy Math and Science Magnet School, 240 Highway 54, Garyville. Staff will be able to assist with applications at the school. Eligibility for Head Start is determined according to federal income guidelines issued by the Administration for Children, Youth and Families, as well as for children who have documented special needs or disabilities. Current family income information, a copy of the child’s birth certificate, Social Security card, immunization record and proof of residence must accompany the application. Other items needed, if applicable, are proof of income, Social Security benefits award letter or check, U.S. entry papers, food stamp print out sheet, documentation of a disability and child’s health insurance card/Medicaid card/LaChip card. If a parent is in school, verification from the school he or she is attending is required. For more information, call the Head Start and Pre-School Program at 985-535-3917.